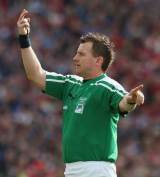 The only referee to have taken charge of successive Heineken Cups, Nigel Owens is a hugely respected figure within the game. A former school technician and youth worker, Owens was appointed as an international referee in 2005 and took charge of his first Test when Japan hosted Ireland in Osaka that summer. Owens made headlines when he came out as a gay in May 2007. During a revealing interview with the Wales on Sunday, he revealed that he had had "to think hard" about going public with his sexual orientation as he feared it might jeopardise his career. However, Owens, who also admitted attempting suicide earlier in his life, was universally praised for his decision and he continued to excel in his chosen field. Indeed, he quickly established himself as one of the most reliable match officials in international rugby and he was Wales' only referee at the 2007 World Cup. The following year, he refereed the Heineken Cup final between Munster and Toulouse in Cardiff and made history when he was handed the 2009 decider between Leicester Tigers and Leinster in Edinburgh 12 months later. Owens was selected as one of the referees for the 2011 Rugby World Cup in New Zealand. During the pool stages of the competition he was accused by Samoa centre Eliota Fuimaono-Sapolu of 'racism' and favouring South Africa during Samoa's crucial clash with the Springboks.